We love this delicious combination of roasted cauliflower and pasta tossed in a zesty arugula pesto with peas and Parmigiano-Reggiano cheese. It's super easy, heart-healthy, and a meal the whole family will love! Step 1. Preheat oven to 400ºF. Place the cauliflower on a baking tray, toss to coat with the oil. Season with salt and pepper. Roast until softened and golden, turning half way through cooking (about 30 minutes in total). Step 2. Bring a large pot of salted water to a boil. Cook the fusilli according to package directions. Drain and reserve. Step 3. To make the pesto, place the arugula, lemon juice and zest, garlic and olive oil in the bowl of a food processor. Pulse and scrape down sides as needed to puree. Add a tablespoon of warm water, or more, to help bring it together, if needed. Season with salt and pepper. Step 4. 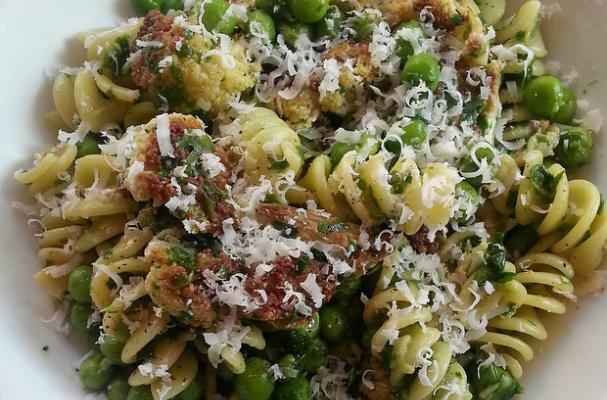 Toss the fusilli with the cauliflower, arugula pesto and peas. Taste and season with salt and pepper if needed. Divide between four bowls and sprinkle with grated Parmigiano-Reggiano cheese.